While in Kodaikanal two years ago, a friend had shown me something up in the skies I only saw once before; that too, as a child. 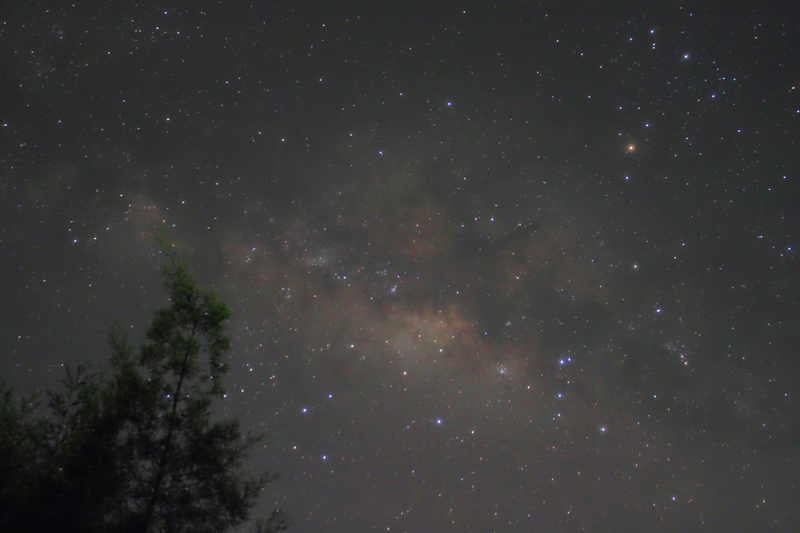 Around midnight, Arun – a photographer and astronomy junkie – and I were taking a stroll to gaze at the stars. At one point, he hurriedly pointed towards a section of the sky above a canopy of trees. There it was. The Milky Way. The only time it had previously crossed my mind was during an afterschool viewing of an episode of Tom and Jerry more than two decades ago. It seemed as though a precious amount of melted cheese had been spilled, in the shape of a large kidney bean, across the drunken burgundy sky. I drooled. Delirious and intoxicated. By the vastness of it all. If I had been athletic enough I would have taken off, clicking my heels and fingers at the same time, like Chaplin Chellappa. Or Charlie Chaplin. It might not have been the first time I had seen the skies paint itself into pretty corners. Giant watercolor portraits of fruit-shaped flambeau. Clouds crayoned in sepia. I had been drunk on them many times before. But never had one prolonged the derangement of my senses in such a beautiful way like the milky one did. To add to the mystique, Arun reminded me that it was billions of years away in a different corner of the galaxy. He then began to scout the terrain to set up the tripod while introducing me to some of the other celestial wonders. Sadly, I have always had the retention capacity of a piece of sun-dried fruit. A lot of the amazing stuff that was said to me has since disappeared from my memory cell blocks. But I know that I had seen a Red Giant – a dying star and a world of poetry unto itself, and two shooting stars. We were startled by a porcupine as it darted out of the darkness and disappeared into it again. And we were also almost run over by a speeding taxi after being blinded by its headlights. But the sight of the Milky Way has remained freshest in my mind. When the universe, for a moment, felt like a benevolent force; keen on spilling its beautiful secrets to us. In 2014, I had attended the satellite launch of GSLV MK III with Arun at India’s spaceport on the Sriharikota Island. You can read about it here – A concert with satellites for drummers.